You have selected the deep soaking Omnitub Duo with 12 Flush-spa™ air spa. If you are looking for something a little more subtle than a whirlpool's massaging jets, perhaps the "up-lifting" sensation of a Pegasus air spa system will give you the pleasant effect you desire. The 12 Flush-spa™ nozzles located in the base of the bath give the bather/s an ambiance likened to a countrysides tranquil "babbling brook". Fitted with our Pegasus air spa whirlpool system, this electronic touch pad control has the functionality you require for your personal Air spa. 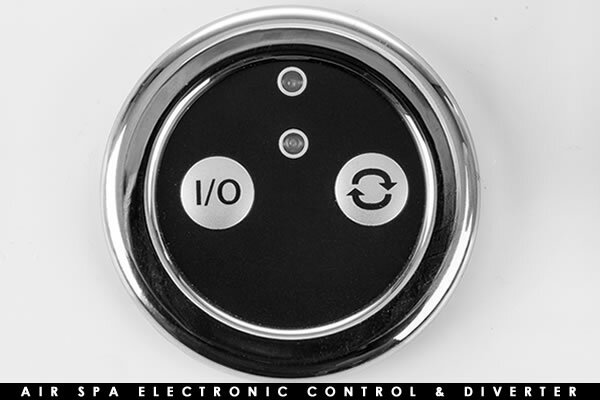 Individually control the spas Flush-Jets™ & chromotherapy lights with this single electronic control pad. 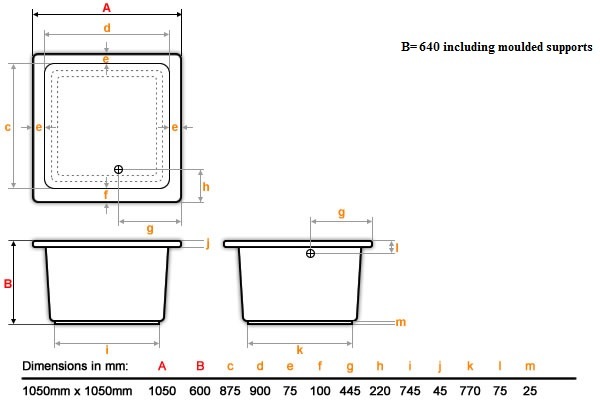 Finished with a modern, rounded, chrome shroud, this type of control can be mounted in various bespoke positions along the edge of the bath (see the diagram above for options). Fitting is undertaken by experienced whirlpool bath fitters who will hand drill your bath and hand fit the pump, jets and controls to your specification. Wherever possible we try and fit the controls so that they are forward of the bather for easy access - this is particularly important for sophisticated electronic controls with many features. Our pumps are sourced from Europe and meet all European standards as do our Electronics. The pump can be mounted at either end of a double ended bath, if you have a toilet or shower at one end, it is usually best to put the pump at the other end. 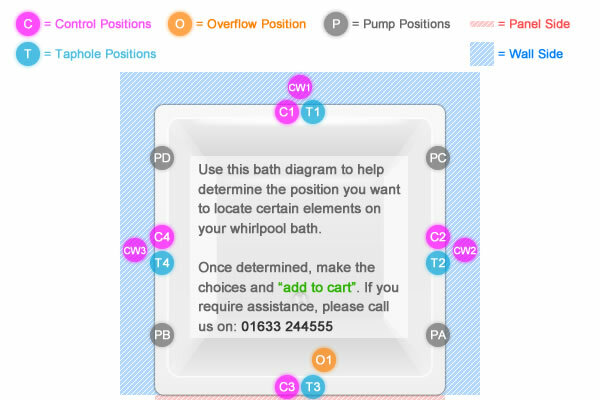 A Pegasus whirlpool bath will always include a special draining pop-up-waste to ensure that the very last drop of water is drained from the pump pipework. Pump Pipework is always constructed using rigid pipe so that it can't sag and hold water. Once the bath has been fitted, it is water tested and operationally tested to ensure that it meets our standards. It will have a running test of at least two hours and then left to stand for 12 hours before being tested under quality control again. Once the bath has been tested it is cleaned and wrapped for delivery to your front door by our own transport. Where possible we prefer to deliver your bath using our own transport. Our insurance covers us for delivery to your door, but the driver will happily assist you to take the bath into your home and even up to the bathroom, at your own risk. The simple "entry level" option - Pneumatic On/off button and manual Air Control - A quick press of the chrome on/off button sends a puff of air down a small tube into an "air switch" in the pump and turns the pump on. A second press repeats the process and turns the pump off again! The manual air control regulates the turbulence of the jets by increasing or reducing the amount of air being drawn into the venturi jets. The Pegasus Electronic-Plus is our entry level electronic control. The neat and unobrusive control pad provides simple soft touch On/Off control of the whirlpool pump and optional Chromotherapy lighting. The features which electronics bring are water level sensing so that the pump can not be run below a certain level of water in the bath, usually just above the jets. This ensures firstly that your pump is protected from being run without water in it and that the whirlpool can't operate below the jets preventing them from shooting water of the edge of the bath - If you have children or a commercial property, this feature is a must - running a pump without water in it will shorten its life considerably. The Pegasus Air-zoning whirlpool system is our mid range electronic control system that comprises an electronic touch pad control that can be positioned in multiple positions on the bath. Features include Pump protection, water level sensing, variable power turbo injection of the venturi, a white LED light and An Air-zoning whirlpool bath is divided into 3 zones (back, sides & feet). You can control the system to run through a sequence & target each zone individually or have all zones on at once. Air-zoning can be used with our Flush-Spa(18 spa nozzles in the base of the bath). Adding air spa jets in the base of the bath adds a buoyancy effect for the bather. The Pegasus Neptune whirlpool system is our penultimate electronic control system and comprises A stylish slimline, electronic Flat-pad control which can be positioned virtually anywhere on the bath with unique features such as variable power turbo injection of the venturi, individually selectable chromotherapy lighting water level sensing and Pump protection. A single Chromotherapy light is provided in the price and up to three extra Chromotherapy lights can be added. Pegasus Neptune systems can be built with just whirlpool jets or as a Hydrobath with 18 Flush-spa jets in the base of the bath. Adding spa jets in the base of your bath gives the bather a buoyancy effect. After the bath has been emptied, the turbo blower will automatically purge the system of water and dry the pipework. The Pegasus Sensations whirlpool system is the ultimate control system. A glass touch-sensitive control screen will never wear out! Featuring: Water level sensing, Pump Protection, variable speed Turbo air injection, wave/auto ramping effect of turbo blower, 4 chromotherapy lights. A two second touch of your finger on one of the four symbols is enough to turn the features on and off and from there on, a simple touch will change the features. The Chomotherapy lighting allows the user to individually select white, ten coulours and five light programs (Tonic, Energy, Relax, Dream & Sun. 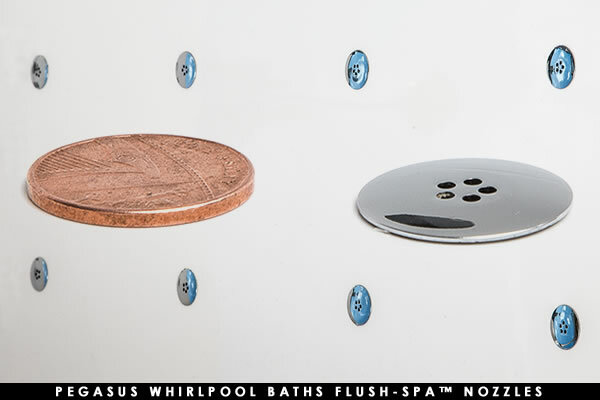 Sensations whirlpool baths can also be upgraded to include our Flush-Spa(18 spa nozzles in the base of the bath). Adding air spa jets in the base of the bath adds a buoyancy effect for the bather. The Sensations Glass control can be bath mounted, but is designed to be wall mounted above the bath where it can be easily reached and seen. Chromotherapy lighting can be operated without water in the bath for tyhose occasions when a mood lighting is required. Your Pegasus Whirlpool Bath is designed to last. We only use quality components and build our baths to a high standard. After the first 2 years, you can extend your warranty on an annual basis for as long as you wish! All whirlpool bath parts are sourced from reliable manufacturers producing high quality, durable components. The chances are once you've installed your Pegasus Whirlpool Bath, we won't hear another peep from you... other than when you're stocking up on your favourite oils of course!